The carpal tunnel is a narrow passageway of ligament and bones at the base of the hand which houses the median nerve and tendons. Carpal tunnel syndrome occurs when the median nerve, which runs from the neck down into the forearm and into the palm of the hand, becomes compressed at the wrist by a fibrous band, the flexor retinaculum. Carpal Tunnel Syndrome is a nerve entrapment syndrome. 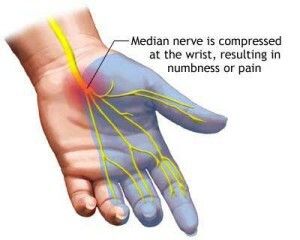 The median nerve controls sensations to the palm side of the thumb and fingers and innervates the muscles in the hand that move the fingers and thumb. With Carpal Tunnel Syndrome (CTS) thickening from irritated tendons or other swelling narrows the tunnel and causes the median nerve to be compressed. Symptoms include pain, weakness (grip strength), tingling, and/or numbness in the hand and wrist. The pain can also radiate up the arm. Often patients with carpal tunnel syndrome wake up with numbness and tingling during the night and as the symptoms worsen it will progress to the day. 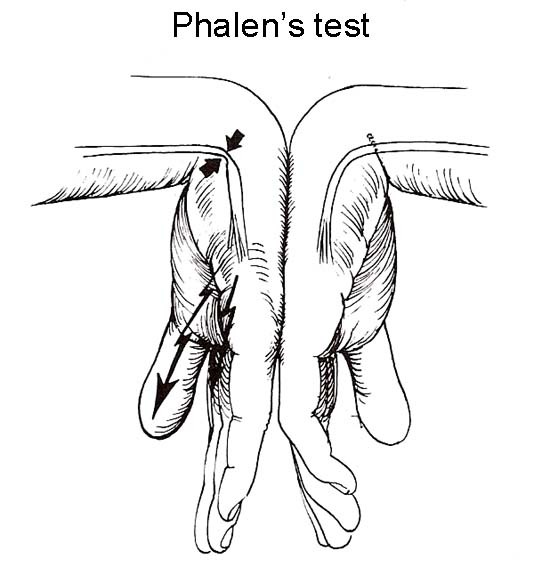 In chronic cases wasting away of the thenar muscles (fat pad on palmer surface near thumb) occurs. 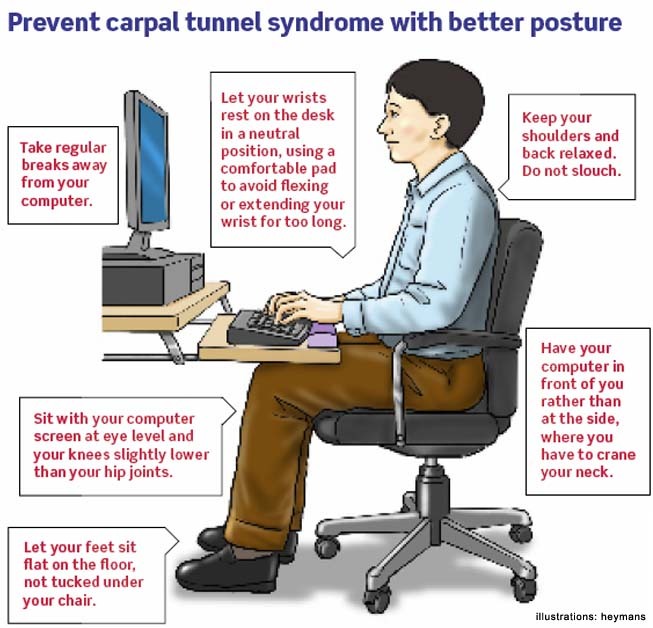 Carpal tunnel syndrome is more common with those with repetitive job duties, poor ergonomics, trauma, overactive pituitary gland, hypothyroidism, rheumatoid arthritis, fluid retention during pregnancy or menopause, a cyst or tumor. 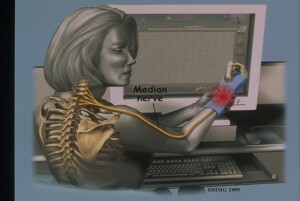 Carpal Tunnel Syndrome is more prevalent in woman due to their carpal tunnel being smaller. Carpal Tunnel can be diagnosed with orthopedic and neurologic testing. The wrist is examined for tenderness, swelling, warmth, and discoloration. Routine laboratory tests and X-rays can reveal diabetes, arthritis, and fractures. Sometimes Nerve Conduction Velocity (NCV) and Electromyography (EMG) tests are used to help in the diagnosis. 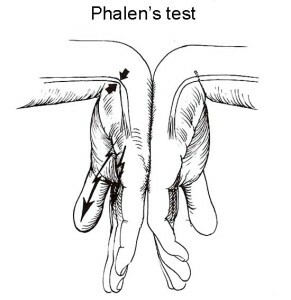 Phalens Test or wrist-flexion test involves having the patient hold his or her forearms upright by pointing the fingers down and pressing the backs of the hands together. The presence of carpal tunnel syndrome is suggested if one or more symptoms, such as tingling or increasing numbness, is felt in the fingers within 1 minute. Doctors may also ask patients to try to make a movement that brings on symptoms. Conservative measures for treatment should be looked at first before considering surgery. Carpal Tunnel Syndrome Treatment may consist of Active Release Technique, High Power Laser Therapy, fixing Biomechanics with bracing, fixing Ergonomics, Gonstead Chiropractic, Ice Therapy, Rehabilitative Exercises (Stretching & Strengthening) or even a referral to a medical specialist if needed.